I’ve done multi-day hikes in the Grand Canyon on five or six different occasions. The first trip in June of 2002 was memorable for the heat. We went from the north rim to the south camping at Cottonwood and Bright Angel. I learned many lessons on that outing, especially related to packing light, dealing with heat, and estimating distances to cover each day. A few years later I teamed up with some good guys and hiked The Canyon in December. What a treat that was! 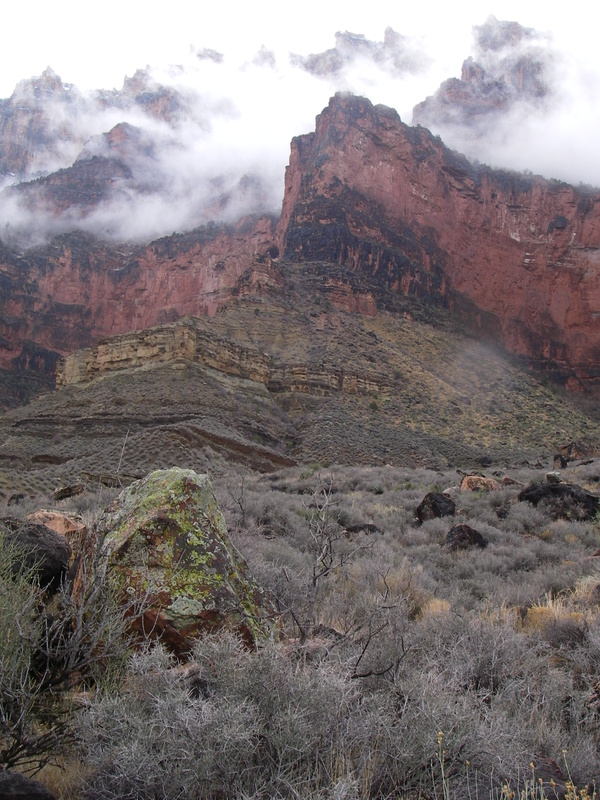 We hiked down the South Kaibab Trail on a cloud of fog which gradually gave way to crisp canyon walls as we walked along the Tonto trail and viewed the soft clouds against the South Rim. The very next winter another trip to The Canyon and then another. I realized this was looking like an addiction but in fact, it was more like a natural magnetic pull I felt toward those majestic walls and their infinite variety of light, texture, and air…THE AIR! It is like visiting a beautiful cathedral without ceilings, as spiritual as physical…as worshipful as it is beautiful. There have been trips to Colorado and New Mexico along the way and I look forward to returning to those locations for more adventures but there’s nothing like the positive addiction I feel toward the Grand Canyon. I’m looking forward to getting my “Canyon fix” again this winter with a great group of hiking buddies! This entry was tagged backpacking list, Grand Canyon, hiking, nature, outdoors, packing list, south kaibab trail. Bookmark the permalink. See a lot of snakes in the Canyon? Even if there are, I would still love to go. Saw a Canyon Rattler on my first trip. I haven’t seen any snakes or insects during the winter. Winter is my favorite time in the Canyon, too. I have done 4, six-day winter trips there over the years(my first in 1981). I will likely take my grandson there in a few years when he’s big enough to make it on the hike out.